Easily rinse stool off cloth diapers. Makes laundry easier and less messy. Installs in just minutes. Includes adjustable spray nozzle and shut off valve. Includes all the necessary parts for easy installation. No special tools or plumber needed. Comes in simple recyclable packaging box, no excessive plastic packaging waste or hassle. 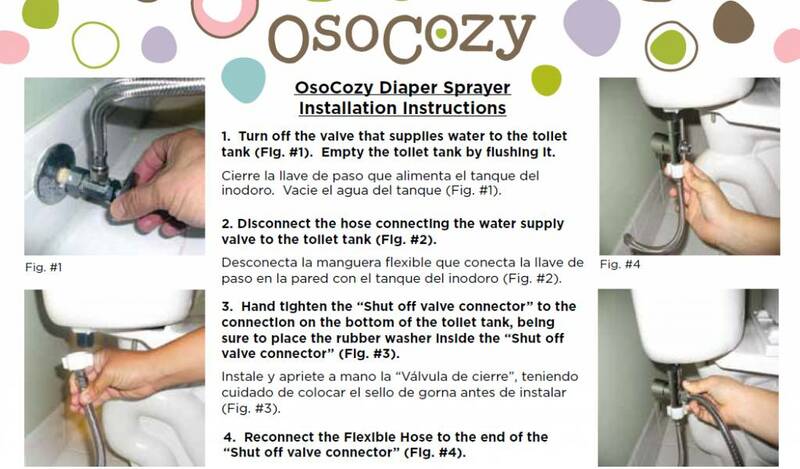 The OsoCozy Diaper Sprayer helps make diaper laundry a lot easier. 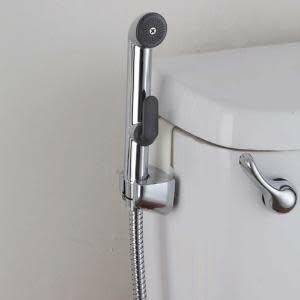 The adjustable spray pressure nozzle provides the cleaning power to get even stubborn poop messes off cloth diapers. Rinse the poop into the toilet without getting hands messy and keep it out of your washer. Angle sprayer at 60 degree angle with diaper held sideways slightly below rim of toilet for best results. Be careful at first or you could get splash back. After a couple uses you will develop your own technique and will be so glad to have this useful tool. This useful tool also results in less diaper pail odor and it allows you to wait longer between washes and off course results in cleaner diapers. 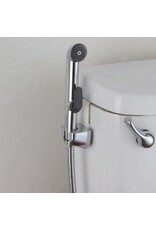 Also useful in bathroom for cleaning potty training gear and if shower or tub is across from or near toilet helps in that cleaning chore as well. Use shut off valve after every use to keep little tykes from "helping mommie clean" i.e. experimenting with spray nozzle. Hangs on side of toilet when not in use.